LG CNS, the information technology services unit of South Korea’s LG Group, has partnered with Korean public cloud provider Megazone to expand the scope of its cloud business, the company said Tuesday. The two companies signed a memorandum of understanding in Seoul, agreeing to jointly research and commercialize cloud platforms, exchange resources and partner for global business expansion. 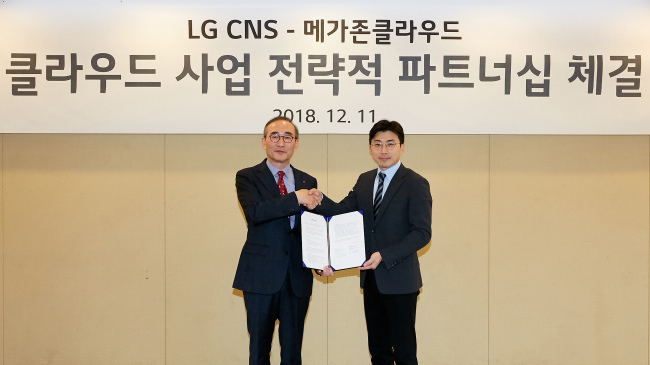 Under the partnership, LG CNS will combine its large-scale cloud service capabilities with the public cloud expertise of Megazone, the oldest and biggest cloud service company in Korea. Together, they will meet cloud service requirements of conglomerates, mid-sized companies and public institutions, said the LG unit. In addition to the latest tie-up with Megazone, LG CNS already has partnerships with strategic global partners in the cloud business, including Amazon Web Services, Microsoft, Google, Salesforce.com, Oracle and SAP. In November, LG CNS was selected to execute a project to transfer Korean Air’s entire IT system to the AWS cloud, which will make it the world’s first airline to undertake a full transition to cloud computing.